TGIF, after work today I am looking forward to a 4 day long weekend. The sun is still shining, summer in full swing, I love it. I have a few cards that I have made on my own to post but I still want to sneak in the cards I made at the last Stampin' Up! workshop before I forget. This weaved section I imagine took a while to make, lucky for me it was already done for us. I think it is a interesting new technique though and might just have to try it on my own. I love summer, I do but I am hot - it has been a long hot week. We need a breeze, just a little one. I have never heard of Victoria ever having an air quality advisory but today we had one, just a little breeze to blow all that nasty stuff away. 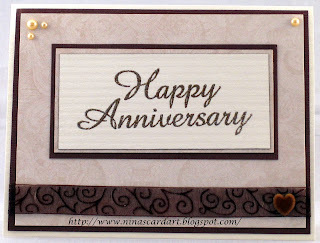 This is a card for my brother and his wife, Happy Anniversary... Have a wonderful Day. 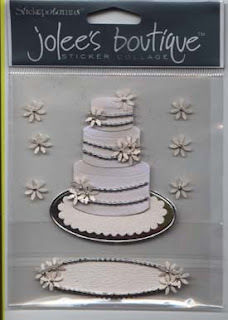 Supplies: Cream and brown cardstock, Designer paper - Hot of the Press Wedding and Romance, All Night Media – Happy Anniversary, Kaiser Scrapbook – Pearls embellishment, Doodlebug Design – Boutique brad, misc ribbon. Tis hot, so unlike Victoria hot. What an amazing summer.. now only if I could sleep. The inside of this card says 'Get well soon'. 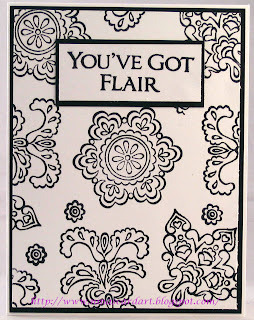 Supplies: Cream and brown cardstock, Designer paper - Flair Designs - What's Cooking Coffee Talk, Stampin’ Up! – Like it like a Latte, Rubber Stampede-Get Well soon, Inkadinkado – Tea/Coffee Cup, Prima Flower – Swaney Collection, misc ribbon, Martha Stewart Frond Branch punch. I recently brought a few stamps by Stamps Happen Inc, image design by D Morgan. I did not have a card in mind when I selected this stamp and I don't think I ever thought I would use it for a Sympathy Card. I think though that it fits. I have not mastered coloring, with shades variations of color but I was happy with basic this go around. Supplies: Cream card stock, Designer paper – Masculine Sara Papers (Hot off the Press), Stamps Happen Inc – A Friendly light, Stampin’ Up! – With Sympathy, misc blue ribbon, 7 Gypsies – Assorted Buckles, Embossing Powder - Metallic Medley. Back to Monday :) . I attended a wedding yesterday, the ceremony and reception were wonderful. My son took the photo of this card so I did not manage to get a picture of the inside. I have all sorts of wedding stamps that I could have used for this card but in the end the embellishments were what popped into my head for this card. I used the little tag embellishment on the inside of the card and stamped 'Congratulations' on it, the tag is not very large and I contemplated trying that for a good 10 mins before taking a chance, all the little silver bead parts are raised so it was difficult to align the stamp. The stamp just fit and it turned out well much to my relief. 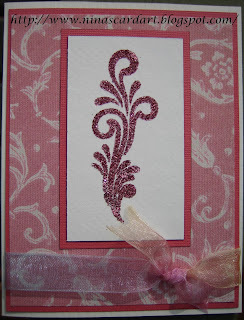 I really like the Cuttlebug Leafy branch embossing folder, it adds elegance to a card. 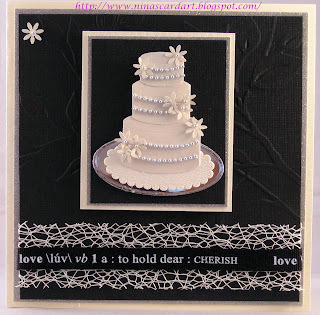 Supplies: Cream and black cardstock, DCVW silver glitter cardstock, misc mesh ribbon, love/cherish black ribbon, Stampin’ Up! – Congratulations, Jolee Boutique- Wedding Embellishment, Cuttlebug – Leafy Branch. ..and then there were three. 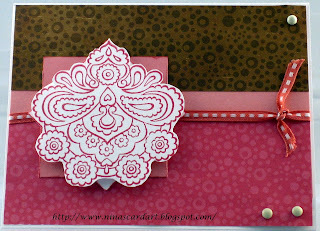 This is # 2 in the set of 3 that was done at the Close to my Heart card workshop using You've got Flair. The sun is shining it is such a beautiful day out and I would love to have the day off just to enjoy it. I has two card gathering this weekend, Friday night was for Close to My Heart. 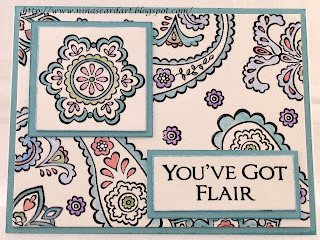 We created three cards using the stamp of the month fo rJuly - You've got Flair. My son is learning how to use my camera so he took over taking the card portraits, not bad me thinks. 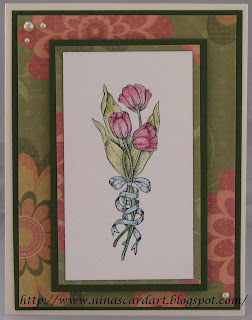 Third and final.. (for now) card with Tulip Bouquet. 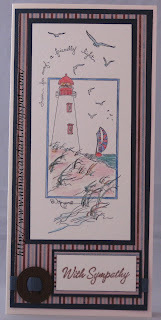 I stamped the image with StazOn Black then used my watercolor pencils to add color. I added light green pearls as small accents. 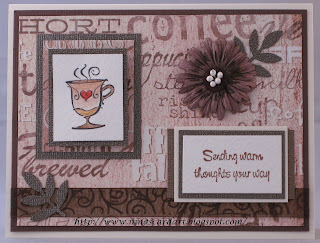 I have 2 card workstops this weekend, one tonight with Close to my Heart then in Sunday Stampin' Up! so I will post some of the cards from those maybe tomorrow or next week. 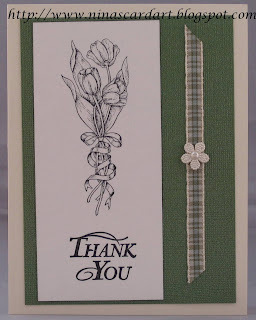 Supplies: Cream and green cardstock, Designer Paper – K&Company Rubber stampede – Tulip Bouquet, Kaiser Scrapbook - Pearls. I tried to do a little vintage on this card. I love these crochet blossoms, I wish I new how to make them. Supplies: Cream and brown cardstock, Designer Paper – DCWV – Luxury Stack, Rubber stampede – Tulip Bouquet, Imaginisce – Crocheted Blossom, Craft Essentials – Rickrack ribbon. Someone please hand me a ruler :). The main layer looks so off kilter and how I did not see it before I took the picture is beyond me. I have fixed it though, but of course did not think to retake the picture. This Tulip Bouquet stamp is one I picked up last weekend from a nice lady selling some of her stamps to make room... for more I am guessing. I wanted to see how many different cards I can make with it until I wanted to move on to something else. This is the first in three so far. 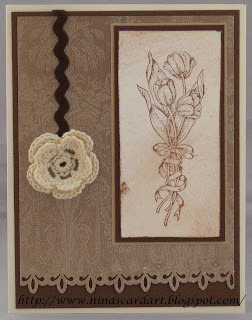 This stamp has so much detail I wanted it to be the focal point on this card with out to many extras. 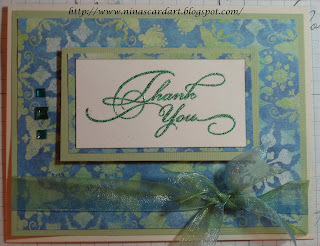 This was a quick put together card, 1 I needed a Thank you card on the spot and second I was excited to try this embossing powder I got from a friend. The embossing powder is a green and bluw mixed with a light color mixed in. I have to say though, this picture is one of the worst that I have taken in a very long time. I think it is time I starting pulling out the light tent again, and be nice to my camera. Supplies: Cream and light green cardstock, Designer Paper - Memory Skor, Close to my Heart - Thank you, Rubber Stampede - unknown color, Sheer Creations ribbon. I really like this cupcake stamp, I went searching through my scrap bin to find the designer paper so I don't recall the maker/designer. This card is for a teenage boy, let’s hope he is suitably impressed. I used multiple layers to build up this card. I stamped the image onto watercolor paper with black versafine ink. 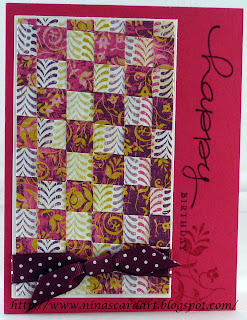 I used my Cuttlebug Swiss dots Embossing folder to get the texture so that there did not look like a lot of empty space. 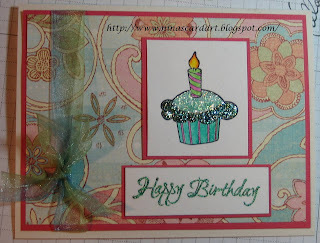 I stamped the Happy Birthday with Stampin’ Up! Whisper White Pigment Ink. 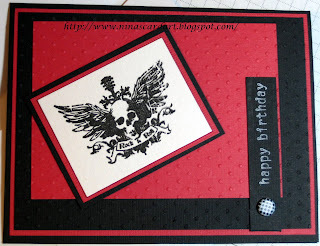 Supples: Black and red cardstock, Inkadinkado – Rock Star, Stampin’ Up! – Birthday wishes, Blac k & White Jazzy Brads. Humm.. yup it is me - the absent blogger. Today is my Anniversary, I was spoiled. My honey brought me a new toy. 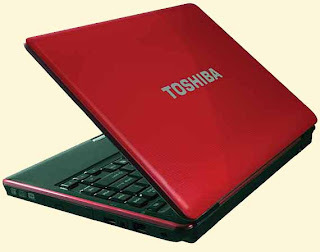 I am such a geek, I have been drooling over this little baby for months now. I apparently am not the best of wives, I followed the rules and only gave a card. Mind you I made it, I can lie and say I slaved over it for hrs but... who would I be kidding. I have been so lazy with setting up the light tent lately, if I can find a patch of sun then I am fine with snapping a picture. It does make the colors pretty bright though. This card is burgundy not the almost hot pink that it appears. Maybe it is because it is a shimmer card stock.. I chose the burgundy and cream because those are colors we used for our wedding. 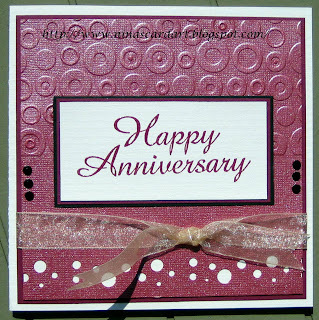 Supplies: Cream and burgundy cardstock, All night Media - Happy Anniversary, cream misc ribbon, black gems, bugundy Stamp'in Up! embossing powder. I used a Cuttlebug Spots and Dots embossing folder for the top half, then used a EK Success - Slim Profile Paper Edger Punche for the bottom. I made a few cards over the last couple of weeks and I know I took photos of them, the camera ate them though and the cards are already gone so I had nothing to post. I was able to sit down and create a little this weekend. With summer here it will be a little harder to post often. Supplies: Cream and pink cardstock, Designer Paper – My Mind’s Eye Screen Door Pink Filigree, Close to my Heart – Butterfly wings, Sheer Creations ribbon, Martha Stewart pink glitter.